A legendary story has it that cheese was 'discovered' by an unknown Arab nomad. He is said to have filled a saddlebag with milk to sustain him on a journey across the desert by horse. After several hours riding he stopped to quench his thirst, only to find that the milk had separated into a pale watery liquid and solid white lumps. Because the saddlebag, which was made from the stomach of a young animal, contained a coagulating enzyme known as rennin, the milk had been effectively separated into curds and whey by the combination of the rennin, the hot sun and the galloping motions of the horse. We certainly did not invent the process of cheese making but had a fascinating & very eventful time learning & establishing our cheese business. We were both involved in stockbroking in Johannesburg and in 1995 decided that we had had enough of the big world of finance. After looking all around the country for suitable second career prospects we bought a smallholding in Underberg, Kwazulu Natal. We moved to River Glen in May 1996 and soon after Punch gave Karin 5 beautiful registered Jersey heifers. The heifers duly calved and after the initial thrill, we had to find a market for our milk. We started selling milk and amasi in the village which proved to be a very erratic market and eventually Punch threatened that either he or the cows must go. Karin having a level head, decided upon cheesemaking, and that is where the fun started. Setting up a small cheese factory was far more expensive than we anticipated and 12 years down the line we are still buying equipment, learning about cheesemaking, marketing & distribution. 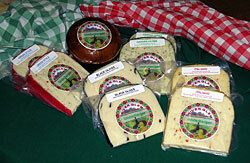 Our cheeses are boutique artisan cheeses. The fact that we do not stabilize our milk and keep all the ingredients and making process very natural, makes our products unique. Each batch of cheese has its own unique characteristics, very much like the wine industry. With this in mind, our cheeses are not available at supermarkets but at a few select delis and farm stalls.